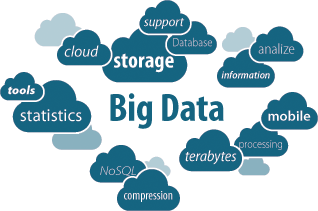 Big Data refers to the massive amounts of data flowing through the various information carrying devices and the cloud. Big Data Solutions enable businesses to delve into the ocean of data flowing as sensors and gain useful insights by analysing and and transforming them into something relevant and full of potential for the business. An average business stores hundreds of terabytes of raw data which grows exponentially due to the profusion of devices on which more data is fed. Big data solutions enable companies to manage all the omnipresent and omnipotent data and make informed business decisions. Adone Solutions provides data management solutions to comapnies that are dealing with immense quantities of data and need a comprehensive program to leverage the data to derive maximum advantage. We mainly use Apache Hadoop, which is an open source platform for storing and processing hundreds of petabytes of data. Our developers can help create a ssystem to handle all kinds of structured and unstructured data regardless of its native format. We realise the relevance of data in daily business operations and in aligning the business goals to current and emerging market trends. Our solutions will enable your business to gain insights in real time through structured analytics.